The KM3NeT detectors are three-dimensional arrays of light sensor modules distributed over large volumes of the transparent water in the deep Mediterranean seas. The detectors are connected to a control room on shore. The geometry of the detectors of the ARCA telescope – i.e. 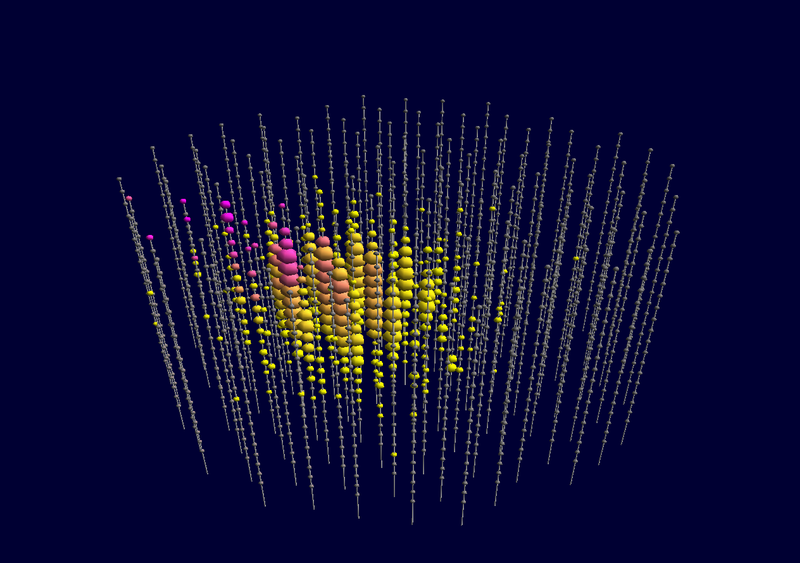 the distribution of the sensor modules in the arrays – is optimised for the detection of cosmic neutrinos. The distribution of the sensor modules in the ORCA detector volume is much denser – i.e. 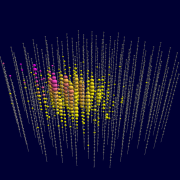 optimal for the determination of the neutrino mass hierarchy. Although ARCA and ORCA differ in volume and geometry, the technology used to build the detectors is essentially the same. The KM3NeT detectors consists of three-dimensional arrays of light sensor modules distributed over large volumes of the transparent water in the deep Mediterranean seas. The sensor modules register the time of arrival of the light, the brightness of the light and the geometrical position of the sensor at the time of arrival of the light. The measurements are transmitted to computers a control room on shore – the shore station – via a network of optical fibres. In the shore station, intelligent software filters the raw data and reconstructs from the measurements the traces of the particles traversing the detector. The results are sent over the public internet to the KM3NeT data centres for further study by the scientists. The KM3NeT neutrino research infrastructure will comprise two types of neutrino detectors: the detectors of the ARCA telescope will be optimised to register the highest energy neutrinos, while the geometry of the ORCA detector is optimal for the registration of lower energy neutrinos, necessary for the determination of the neutrino mass hierarchy. In particular the density of light sensor modules in the detection volume is different for ARCA and ORCA. In the construction phase KM3NeT 2.0, the ARCA telescope will have a detector volume of about 1 cubic kilometre. In this volume, more than 4000 sensor modules are sparsely distributed attached to vertical strings with a height of about 700 m. The density of sensor modules in the ORCA detector is much higher: about 2000 sensors in a volume about 250 times smaller than that of ARCA.